Mine is going to be unpainted steel gray with silver and orange accents. Leather saddle and riser handlebars. 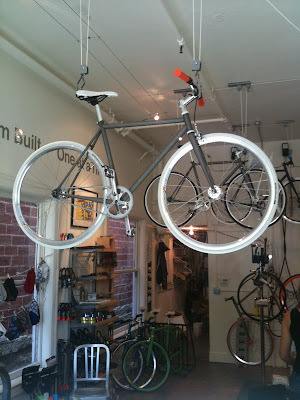 I'm not audacious or crazy enough to opt for a fixie (fixed gear). 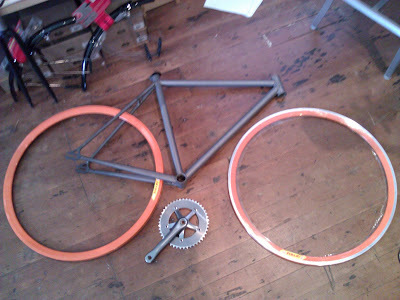 Instead trying to decide whether to be pure with a single speed freewheel, or go with the Shimano Nexus eight speed hub. Context: I've decided to get a city bike. So last week-end I spent a couple of hours at Mission Bicycle on Valencia Street in San Francisco "designing" my new two-wheeler. I should probably point out that by hard-core bike enthusiast terms I am not technically "designing" the bike. I'm simply picking and choosing all the components, colors and options in order to get a custom assembled bike. And that's exactly what I want. Here is what "my bike" looked like last Saturday. The bikes are assembled around a few stock components such as the frame. I chose my frame size (with expert assistance from Jefferson the General Manager since I didn't know what I was doing) and then the fun began. Between the large variety of colors and combinations of parts I put my personal touch on the design of my bike, and then they hand assemble it for me. Very cool! They have made some interesting and appealing decisions such as not adding a logo on the frame. This is going to be MY bike. It'll take 3-4 weeks before they actually complete. The wait actually adds to my total experience. I'm walking around excited to see how it all comes out in the end. I can't wait to see it and make final tweaks once it's done.... so I can begin to criss cross the city on my gray, silver and orange two-wheeler. While Mission Bicycle "designed" the frame of my new bike, it is being manufactured overseas. My only complaint! Why can't they manufacture them in the US? Mission Bicycle is pointing to an interesting trend of increasing personalization and customization options of an wide array of the products and services. We've grown accustomed to personal iPhone covers, laser etchings on the back of mobile phones and laptop stickers as a way to express our individuality through our tools. Cool skiing stickers on the back of my laptop has become a way to say "hey I'm more than just another a bland corporate drone". Just like fashion has been a way to express our individuality, or not, simple product customization is becoming a way to do the same. When I recently got a new car I configured it online. Even your new home can be now be designed and customized online from prefabricated components getting a semi-custom high quality product without the price tag normally associated with building a custom home. In a world where almost everything is available in original and knock-off versions with a quick search online, I want the bike I ride, the computer bag I carry, the home I build to be a reflection of my values and my style without spending the huge premium that is normally associated with custom design and production. Mission Bicycle offers assembly of a wide variety of standard components in order to build a product that fits my style and need. If you're looking for a city bike I suggest giving them a look. It's a good quality product AND you can make it a personal statement too. I predict this is just the beginning. New manufacturing techniques are going to allow us to custom assemble a larger and larger range of products until it becomes the expected norm.